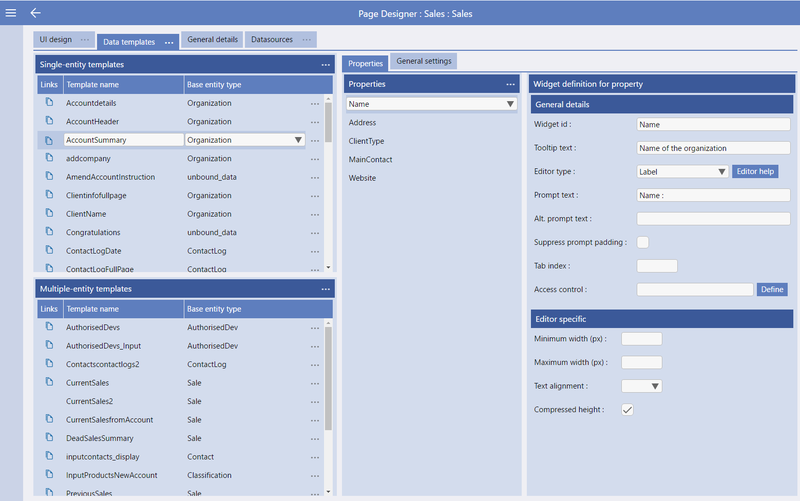 If a Segment, in the UI Design of a Page, contains data, actions or is linked to a data object (i.e. a selection, button, etc) then the structure is controlled by a Template. 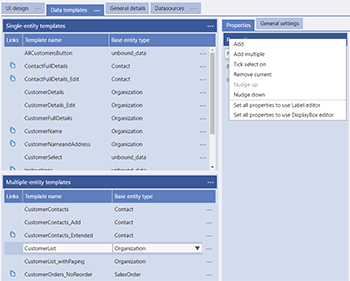 Templates are specified as either Single Entity templates or Multiple Entity Templates (Single for data from a single record and Multiple for displaying a data grid of multiple records in a table). When you have created a Template you can select this in the General Tab in the UI Design from a drop down list of created or linked Templates. Please see image left. As shown in the image on the right, for each template you need to specify a name and a base Entity type or use one of the temporary (unbound) data areas available on each page. Templates are made up of a many Properties, from the base Entity, or temporary unbound data areas as you wish. Tick Select On - Turns on the "Tick Select" option on the Property list so that you can select multiple properties to delete, remove, etc. Remove Current - Remove the currently selected Property from the list. Nudge up - Allows for re-ordering the Property lists - Nudge up moves a selected item up 1 place in a list and the menu remains active so that you can click the same item in the menu multiple times to move the Property multiple places. Nudge down - Allows for re-ordering the Property lists - Nudge down moves a selected item down 1 place in a list and the menu remains active so that you can click the same item in the menu multiple times to move the Property multiple places. Each Property must have an Editor Type, a definition of the display widget ("Widget") that will define the display function. Widgets can be simple i.e. display Property data value or can call device features i.e. the device datapicker, they can incorporate image uploading and any other screen function that you may require. This is the list of Widgets available to use within Evoke and whenever a Widget is selected in the Editor Type the "Editor Help" button will take you to a full example and description of implementing/using that specific widget. Examples of the use of all widgets is available here. Editor Type - the definition of the display Widget that will define the display function. The "Editor Help" button will take you to a full example of using that selected widget. Prompt text - (single entity only) the prompt for what is to be input, e.g. "Name", "address", etc. If you do not have or want a prompt BUT want the sizing of the label (other widget) to appear the same as the others then add an underscore "_" into the prompt box. Column header Text - (multi entity data grids only) the column header for this specific column, e.g. "Name", "address", etc. DataGrid Columns have an automatic "tooltip" of the column header text that will be displayed, in full, when the Column header is 'hovered over' on devices that provide this capability, such as desktop computer screens. Numeric Coercion - (multi entity data grids only) only for alphanumeric fields. Forces Evoke to see an alphanumeric number as a numeric number when sorting is used on the datagrid. 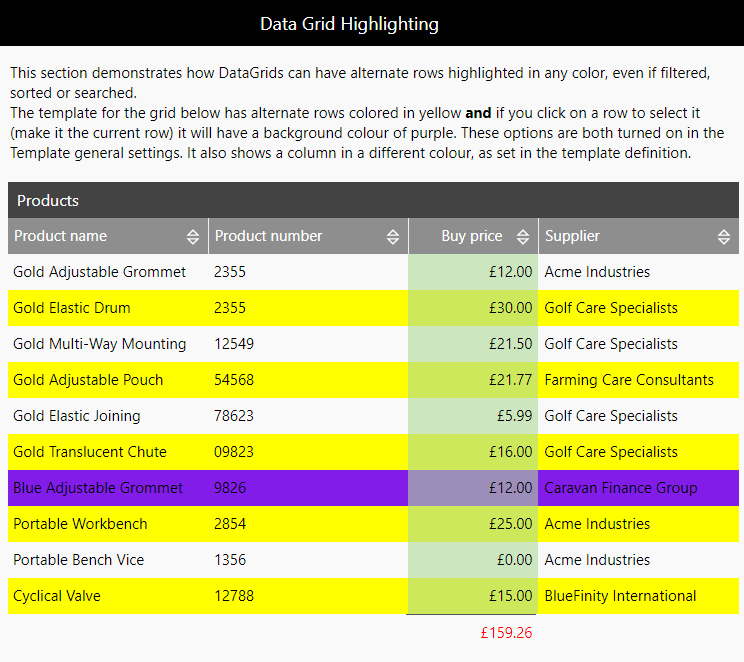 Column Background Colour - (multi entity data grids only) used to set the background colour of a specific column in a datagrid. Each Template also has "General Settings" associated with it. 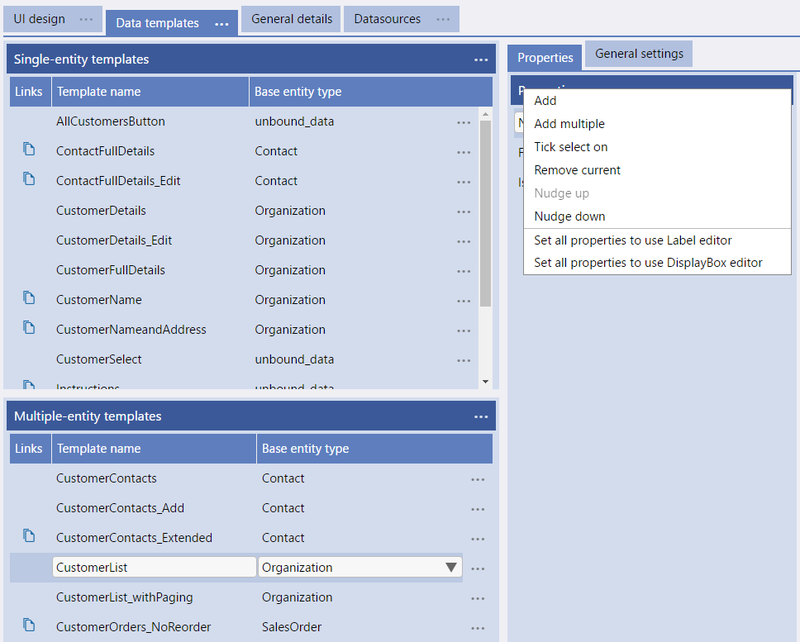 These are different for Single Entity templates and Multi-Entity Templates. The settings are as follow. 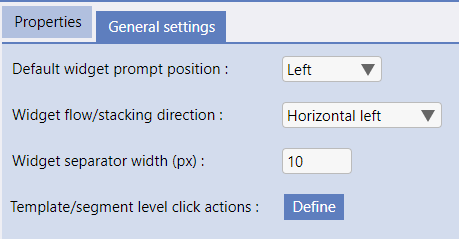 Template Level Click Actions - the Evoke Click Actions associated and used by this template. These are used in conjunction with header actions. Select first row on load (checkbox) - Determines, when data is loaded into the data grid, if the first row should become the selected row or not. 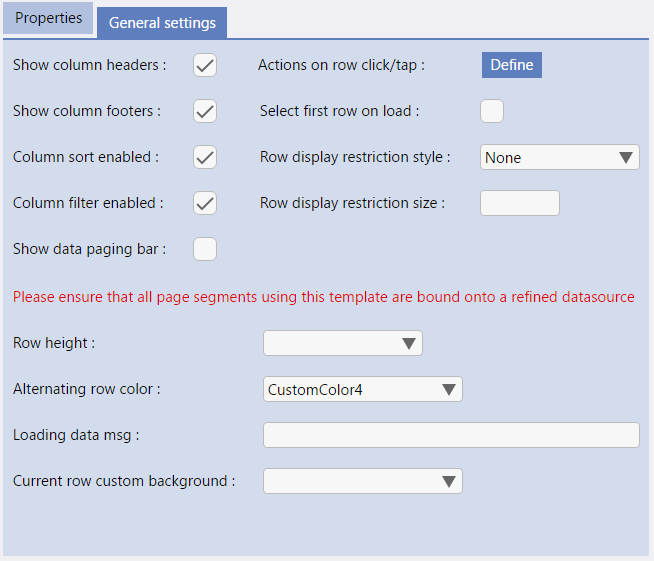 This checkbox is regularly used when the page contains other data segments showing related data. Row display restriction size - used to limit the number of rows shown in the data grid. Row height - defines the row height of the rows in the data grid. The default is a single line row height of 36px. Alternative options include 8 additional heights from 76 pixels through 356 pixels. Alternating Row Color - if selected then the alternate rows in this datagrid will be highlighted in the color selected from the available app color pallets. Any colour can be selected for the highlight colour. Loading data msg - any text entered here will be displayed in the first line of the datagrid while a selection against the database (to populate the datagrid) is being performed - so that users know data is being retrieved. Current Row custom background - if selected with a colour then the currently selected row will have a background of the colour chosen. Any colour can be selected for the background colour.